You've probably heard a lot of buzz about Shea (pronounced "shay") Butter lately, and that's because it is well deserved. Intensely rich, this body butter will sink deep into the skin's tissue for all-day moisturizing and unparalleled softness, chasing away any chance of winter dryness or cracked, chapped skin. 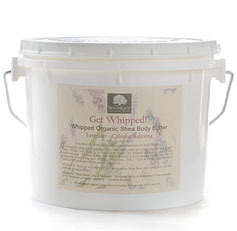 Get Whipped! is made with over 85% pure Certified Organic Shea Butter, which we've whipped and whipped to a lighter, friendlier, more spreadable texture. 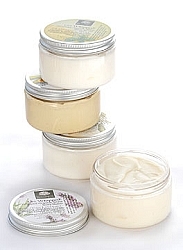 And to make it extra-delectable, we've fortified our shea butter with vitamin-rich, sumptuous cold-pressed oils of organic avocado and organic sunflower, then finish it all off with our signature pure essential oil blends. How to Use: Scoop up just a small amount of butter with your fingers, melt between palms; apply sparingly to hands, feet, legs, torso and arms for a sumptuous, all-day softness. Remember--this is true butter and contains no emulsifiers, chemicals or fillers. Applied correctly, Get Whipped! will absorb quickly and completely, with no greasy afterfeel. 100% natural, just like all WoodSprite handmade organic products. 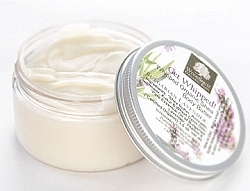 In Spa Treatments: Get Whipped makes for a truly transcendent spa body treatment; Use it in an intensely moisturizing body wrap, as a luxurious massage medium, and in manicures or pedicures. Unscented: Available ONLY in 32 oz or 64 oz Professional/Backbar Sizes.